Yes, this is indeed where my life changes quite significantly. The period of time between the end of my exams and results day on the 13th August 2015, was a time of great anxiety and much uncertainty about the future. I was completely in the dark about how the next year was going to go, whether I would be re-sitting exams, working or even travelling. 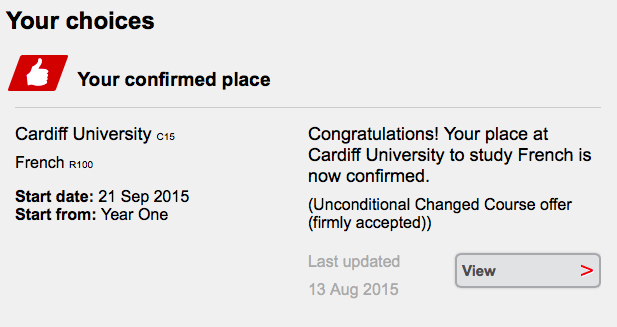 Thankfully however, after the singularly most stressful morning of my life, I received a change of offer from Cardiff University, my insurance choice, for which I am so very grateful. 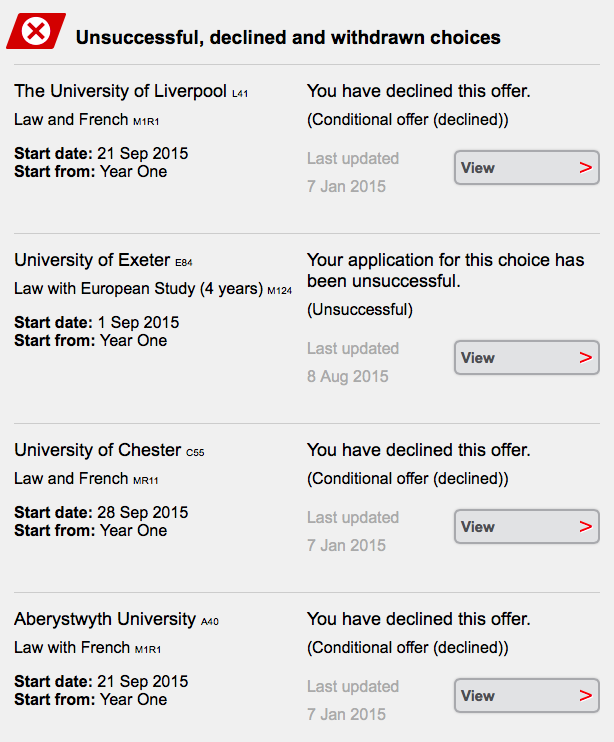 Initially, I applied for Law and French and had accepted University of Exeter and Cardiff University as my firm and insurance choices respectively. Unfortunately, I didn’t achieve my predicted grades which resulted in an awful results day morning, full of slight disappointment, the anticipation of waiting on a decision from Cardiff, and hundreds of calls to clearing hotlines. In the weeks leading up to results day, I had been considering more and more the idea of clearing and studying straight French and it was becoming ever more appealing. For this reason, the phone call offering me the chance to study French at Cardiff University was quite possibly the best thing that could have happened. The whole A-Level and UCAS application process has gone by so quickly and it seems absurd that I will be starting university in less than month. It’s all so very exciting and daunting at once, but I am certain that this is the right decision and that I will learn so much and benefit so greatly from the entire 4 year experience that I am embarking on. So, what happens to the blog from here? I plan to continue to share with you the books that I have bought and my thoughts on the books that I have read. However, from now on, some of these may be course related and posts regarding my university life may begin to appear. I hope you decide to tag along for the ride. If you’re even a fragment as excited about it as I am, it’ll surely be worth it. Disclaimer: Featured image is not my own, it was found on a Google search for Cardiff University’s Modern Language Department.